Everything from the food to the hotel, the big cities and small villages, train rides and professional soccer games, this program offered me an eye-popping introduction to the competitive lifestyle of soccer in one of the game's most traditional countries. The clinics and friendlies really gave the kids insight into the level of play outside the United States. We stood in awe of the Brazilian's natural fluidity with the futbol. Their technique and movement were amazing! Yes, the kids cam back humbled, but they also came home motivated, knowing what they had to work on to improve. Playing against great competition, Kevin was able to display his skill in front of many scouts and coaches. Beto and Sobrinho are very good about communicationg feedback to the boys, and the trip definitely raised Kevin's game. He's now aware of the commitment and dedication required to play at the next level. The trip was one of the most memorable experiences of my life. I learned so much from the Brazilian instructors and from everybody over there. I guarantee you that I will never forget the nice moments I had in Brazil. Thanks again. Assist coach men's soccer team and responsible for Goalkeeper Trainer. Ithaca College 2003 Traveled to Rio de Janeiro, Brazil. "I was fortunate to be able to participate with Club Regatas Flamengo for 20 days". Oportunity to participate clinics and friendlies games and culture. 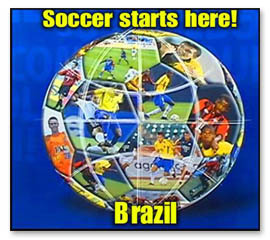 "Brazil Pro Soccer School is the best! From the planning process to handling emergencies, they exceeded all expectations. I strongly recommend them if you want a great experience." "After nearly a trip with Brazil Pro Soccer School, I can't imagine working with anyone else. I thank them for opening soccer and cultural horizons for hundreds of our players". "Why does Brazilian soccer hold so many of us spellbound? I know when I'm watching the Brazilian National Team play, I am truly entertained". Read more in his paper for the soccer journal.